Having lived in Thailand for several years, I have personally witnessed countless acts of animal cruelty from people running over stray dogs with their cars and failing to stop to give assistance, to live frogs and lizards being sold in plastic bags to cows, buffalos and pigs being transported in the back of a pick up-trucks without shade, food or water. 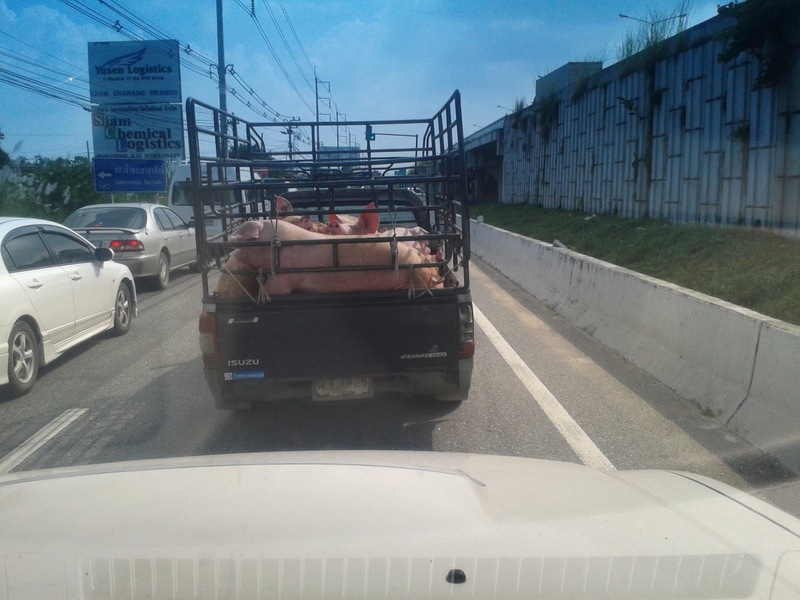 This photo was taken from inside our pick-up truck, whilst we were waiting at traffic lights, on the motorway slip-road between Sriracha and Pattaya. I counted at least 6 pigs and you could hear the squealing over the sound of both the engine and the radio. 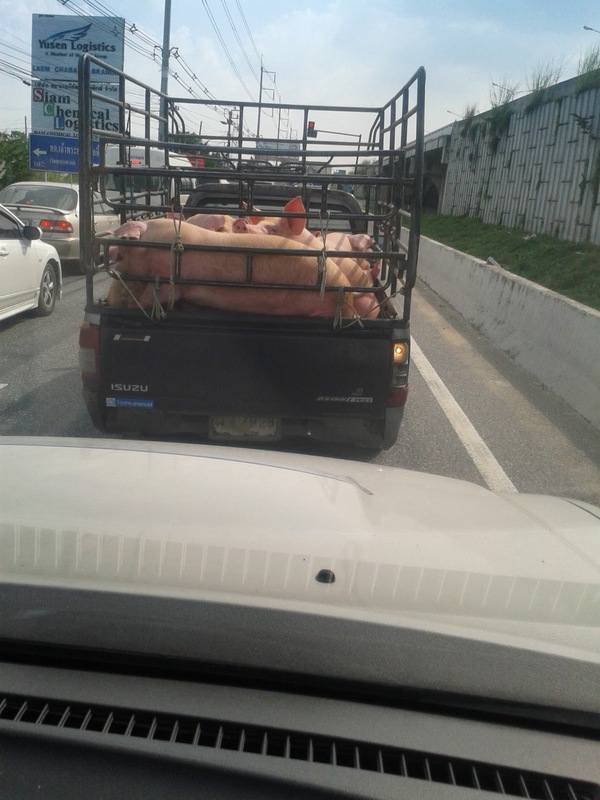 I have now stopped eating pork in Thailand as a result of seeing this!!! I understand there are enormous cultural differences between England and Thailand but this kind of cruelty is just unnecessary. 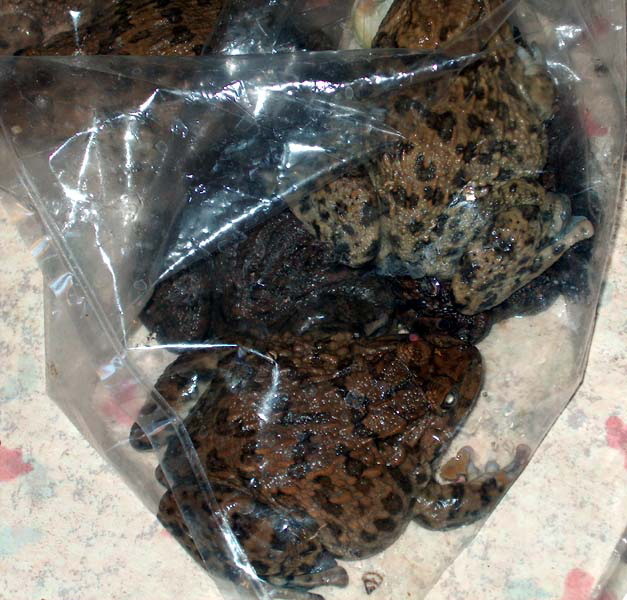 I have no problems with people eating frog per se, but at least keep them in humane conditions before they get deep-fried!!!! The frogs will slowly suffocate and eventually die when they are kept like this. Thais care little for animal welfare or issues of conservation, they are primarily concerned with making money. The majority of Thai people are extremely poor by Western standards and view animals as a commodity to be bought and sold. There is also a lack of education about the environment and the laws governing cruelty to animals are very lax and poorly enforced. You would have thought that an animal, which provides you with employment and an income, deserves a little kindness. But, unfortunately this is not the case in Thailand. I often ask myself the question, are poverty and ignorance ever an excuse for cruelty? And the resounding answer is, no. 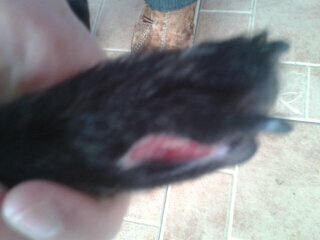 You may be asking yourself, what had this poor dog done to warrant such abuse? Well let me tell you........it had the temerity to bark at the man while he was out walking his own dog. Can you believe that? What a complete c*nt.....I hope that karma will catch up with him pretty soon and he gets b*llock cancer or leprosy. Hardly a week goes by without reports of dogs being smuggled from Thailand to neighbouring countries such as Vietnam to supply the dog meat trade. The troubling aspect of this trade isn't so much that different cultures like to eat dog, it is simply the inhumane way the dogs are transported and slaughtered. Dying to travel in Thailand?